Daytime Brown Eyes Makeup Tutorial. Enhance your brown eyes with this daytime makeup look that you can easily wear for school or work! 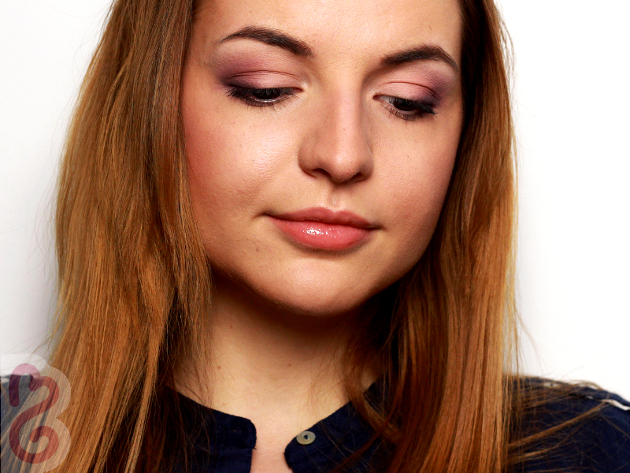 Use tones of pinks and purples to add color to the eyes, a healthy flush to cheeks and glossy shine to the lips. Follow this easy-to-follow brown eyes makeup tutorial with steps to help you copy the look, along with a few tricks for long lasting, flawless makeup. Prep the face by applying a primer for oily skin to reduce shine, concentrating on the T zone. For normal to dry skin types, skip this step and use your favorite moisturizer. Use fingers to apply your liquid foundation and work it into the skin with a foundation brush using quick and light downward motions. If you need more coverage, apply a lighter shade of foundation in the center of the face, to middle of the forehead, down the nose, cheeks and chin. Use your brush to blend it in. Next apply a liquid concealer to cover dark under eye circles, gently tapping with the ring finger to work the concealer into the skin. Then conceal any imperfections with a small stiff brush. Set everything into place with a translucent powder, then move onto the eye makeup. Maximize the color and wear of your eyeshadow with a primer. Apply a matte pink eyeshadow to the entire upper lid, then work a plum eyeshadow into the crease and outer corner of the eye. Blend with a semi-firm brush using circular motions without too much pressure and create a soft transition between the two colors. Define the bottom lash line with the plum eyeshadow that will further enhance brown eyes. Add more depth to the eyes and an appearance of thicker lashes by adding a darker shade of violet or even black to the base of the lashes. Blend it in an upward motion to lift the eyes. Highlight the brow bone with an ivory eyeshadow and finish off the eye makeup with two coats of your favorite mascara. Define eyebrows and even them out with an ashy brown color. Lightly fill in any sparse areas between the hairs. Sculpt the face by contouring the cheeks and nose for a narrowing effect. Then add a touch of color to the cheeks with a pink blush. Set the makeup with a thin layer of translucent powder and finish off the look with a light peachy lip gloss. Our daytime makeup look for brown eyes is complete. Besides this pink and plum eye makeup look, women with brown eyes have probably the most colors to choose from. The best eyeshadows for brown eyes like teals, purples, blues and pinks, taupes, coppers, bronzes and chocolate browns will all bring out a brown iris beautifully.